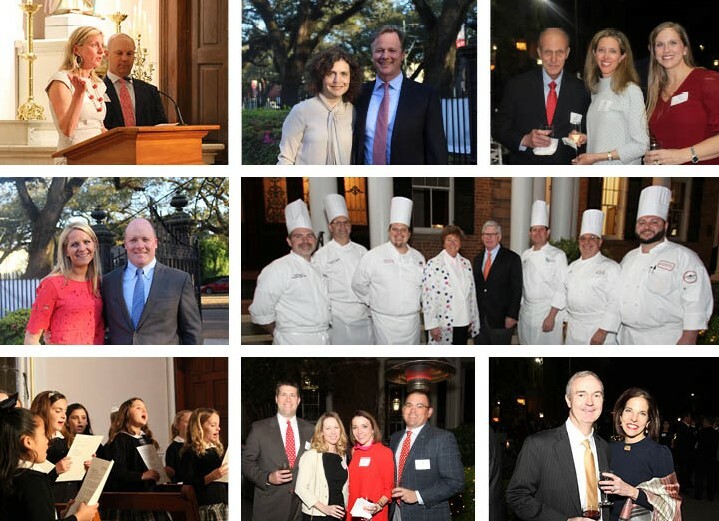 Members of the Sacred Heart community joined Headmistress Sr. Melanie Guste, RSCJ, on March 20 to experience the flavors of New Orleans during a celebration honoring the Headmistress' Circle of Donors for their contributions to the 2018-2019 Annual Giving Campaign. The evening began in the chapel with a Mass of Thanksgiving celebrated by Fr. Frank Reale, S.J., which included music courtesy of Les Jeunes Chanteuses, the Sacred Heart third and fourth grade choir directed by Jodi McWilliams. As the sun set, guests circulated to the historic front courtyard and enjoyed delectable cuisine generously donated by the Ralph Brennan Restaurant Group, as well as musical entertainment by the Joe Simon Trio. Sr. Guste expressed gratitude to Eugenie and Billy Gibbens (2018-2019 Annual Giving Chairs) and the Headmistress' Circle of Donors for their generosity and commitment to Sacred Heart. She also thanked Ralph Brennan (Owner, Ralph Brennan Restaurant Group) and the chefs in attendance: Chip Flanagan (Executive Chef, Ralph's on the Park), Brett Gauthier (Corporate Executive Pastry Chef, Ralph Brennan Restaurant Group), Chris Montero (Executive Chef, Café NOMA), Jonah Nissenbaum (Executive Sous Chef, Red Fish Grill), Slade Rushing (Executive Chef, Brennan's), and Chris Vazquez (Executive Chef, Ralph Brennan Catering & Events).